Two-factor authentication app for BlackBerry 10 released | BlackBerry Blast! There are several two-factor authentication apps for BlackBerry, but Cyphercor Inc. is throwing their hat in the ring for BB10. The company announced their native two-factor authentication app for BlackBerry 10. 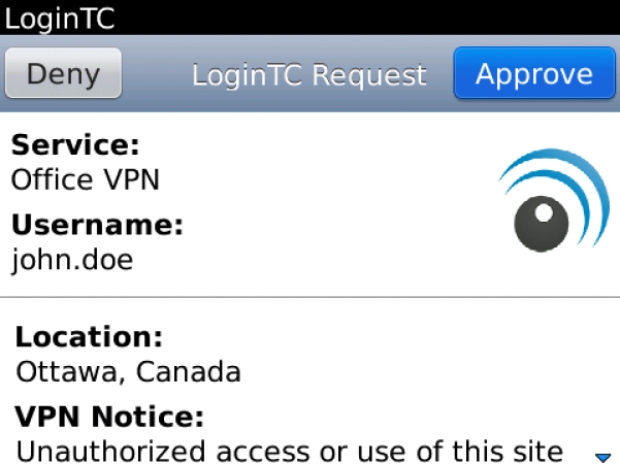 According to the page in the BlackBerry World, the LoginTC app allows users to securely log on to LoginTC-enabled websites and applications. This LoginTC app also allows a user to have multiple LoginTC tokens to access multiple LoginTC-enabled websites and applications. The full press release follows. LoginTC � a leading two-factor authentication solution � releases new native app for BlackBerry� 10 OS in an effort to provide BlackBerry users with simple, secure, scalable & cost-effective 2-factor protection for access to online assets. March 12, 2015 (Ottawa, ON) // BlackBerry users seeking enhanced login security via two-factor authentication (2FA) can now protect their digital assets without sacrificing an optimal user experience, as Cyphercor Inc. releases its native LoginTC app for Blackberry 10 (BB10). Rebuilt from scratch, the new app, made exclusively for BlackBerry� 10 OS, is primed to provide the highest quality of performance � from stability to speed and resolution. All BlackBerry 10 devices are supported: BlackBerry Q10, BlackBerry Z10 and BlackBerry Passport. An exciting key feature of LoginTC�s BB10 app is language localisation, which means the app is available in both of Canada�s official languages: French and English. The app will automatically detect the user�s language preference based on existing settings on his or her BlackBerry. Also exciting, this release marks the beginning of LoginTC�s transition to user-empowered testing across all mobile platforms. User-empowered testing gives end-users who are not administrators the control to run diagnostics, which ensure the system is functioning properly, directly from their devices without admin assistance. The marriage between user and administrator powered protection further solidifies the security of any establishment on two levels: individually and as a cohesive whole. �Our goal is to deliver an exceptional and safe user experience that meets our clients� needs, regardless of what mobile device they use � whether that�s an Apple iPhone, a Google-driven smartphone or desktop, a tablet or a BlackBerry,� says Hernan Matute, CEO of Cyphercor. In a mobile market that prioritizes the development of apps for iOS and Android, Cyphercor is committed to ensuring that its BlackBerry customers, like all its customers, remain fully protected from the threat of cyberattacks and stay fully satisfied with the products they use to do so. The app is available for download from the BlackBerry World app store for free at http://appworld.blackberry.com/webstore/content/59952837/. LoginTC is an enterprise-grade, cloud-based two-factor authentication (2FA) solution that leverages virtualization and mobile investments to complement and protect existing IT practices and infrastructure. It delivers an elegant and supremely secure online experience, scalable for millions of users, without significant costs. End-users install the LoginTC app on their mobile device (Blackberry, Apple, Android) or Google Chrome, converting their device or desktop into a second factor credential by loading administrator-issued tokens in the app. Future first-factor (username/password) access attempts to a LoginTC-enabled VPN or corporate application push a second factor request to the device. The rich app interface then prompts users to approve or deny the access request. Companies ranging from SMBs to enterprises � including LTG Federal, Infostrada and Harlequin � as well as government organizations already trust LoginTC. This can be attributed to LoginTC�s unique and sought after characteristics: no Personally Identifiable Information (PII), secure remote password (SRP) protocol protection, push notifications rather than SMS for worldwide access, and fraud detection integration with dynamic CONTEXTUAL information for real-time threat alert. Cyphercor Inc., the developer of LoginTC, is headquartered in Ottawa. For more information, visit https://www.logintc.com/.